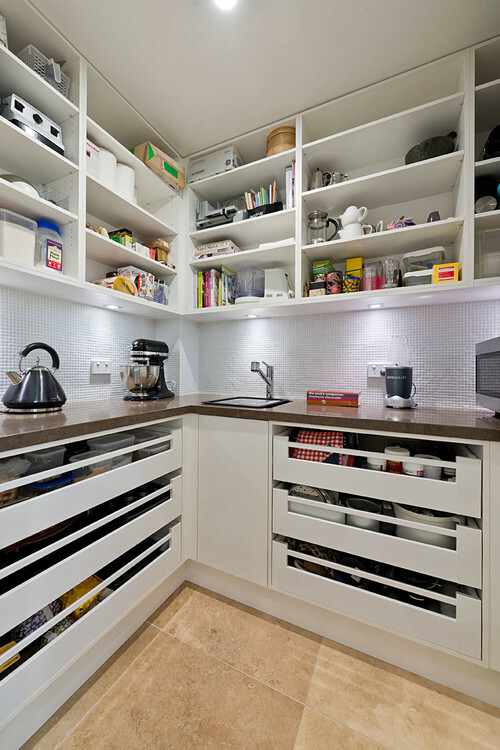 If you are lucky enough to have the room in your house for a butlers pantry, there are a number of things you might like to take into consideration when planning this space – this article from the Houzz website looks at what you might consider. As a butler’s pantry is a natural extension of the kitchen, giving the user extra space for storage, an area to prepare food in and a place to hide away mess from dinner guests, it can be a stand-out feature in any home cook or entertainer’s dream house. Before you finalise your new plans, check out this guide to planning the perfect butler’s pantry, which details you should include to ensure you get the best use of your space. Try to incorporate as much bench space as you can into your butler’s pantry. You can use the space to put small appliances on, as a landing space for all your grocery shopping before you unpack everything, and even as a work bench when preparing meals when you don’t want to do it in the kitchen. The butler’s pantry pictured here is huge and much bigger than most of us could even dream of having in our homes, but your butler’s pantry doesn’t have to be this big for it to work well for you. A designer can usually help you make the most of the space you have. 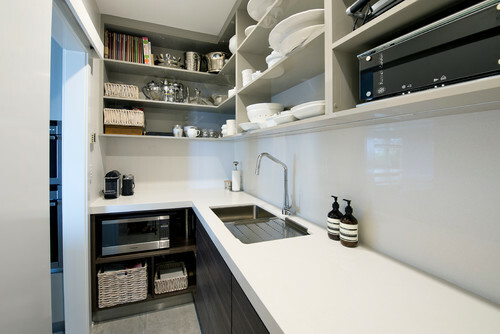 If space is tight, you don’t need to make a benchtop the same depth as your kitchen benchtop (which is usually 600 or 700 millimetres deep). A depth of 400 to 500 millimetres will be sufficient for a butler’s pantry and will give you more floor space to move around the area easily. Small appliances, such as microwaves, rice cookers, slow cookers, juicers, and even coffee machines and toasters, are items my clients continually tell me they don’t want to have taking up valuable space on their kitchen bench. However, they don’t want to store them away either, which is why housing and using them in a butler’s pantry is the perfect solution. Instead of putting your regularly used appliances away after each use, keep them plugged in on the benchtop so they are always ready for action. TIP: Calculate how many power points you will need … then add more! You can never have too many. Providing plumbing isn’t an issue, consider incorporating a sink in your butler’s pantry. Most sinks will require a benchtop depth of 600 millimetres, however, if your space is limited, there are some stainless steel laundry tubs suitable for use in only a 500-millimetre-deep benchtop. In any case, a laundry tub style of sink is ideal for a butler’s pantry. Look for a wide, deep sink that you can wash large pots and pans, oven trays and even barbecue racks in. Having such a sink in your butler’s pantry will mean you can opt for a smaller single-bowl sink in the kitchen if you wish. It also means that during cooking you can hide away dirty pans for later washing while you feed your family or entertain guests. The key to a successful and efficient butler’s pantry is being able to walk in, take a look around and quickly find what you need. Most butler’s pantries will have an entrance door that can be closed, or be positioned behind a partition wall so that the space is not visible from the kitchen. This means you won’t need to worry about having doors on the cabinets inside the pantry – above bench level open shelves are a smart and versatile storage option. 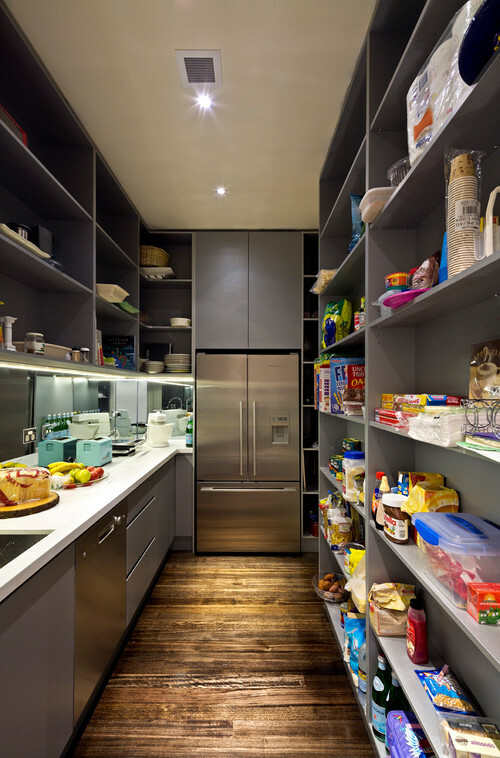 Work with your designer to incorporate adjustable-height shelving in your pantry so you can move the shelves up and down depending on what you want to store on them. Also consider running the shelves all the way to the ceiling. You can use the top shelves, which are not as easy to access, for storing items that you only use very occasionally, such as specialty ovenware or table settings only used at Christmas time. Keep a small step ladder or stool in or close to the pantry so you can safely access the higher shelves when you need to. 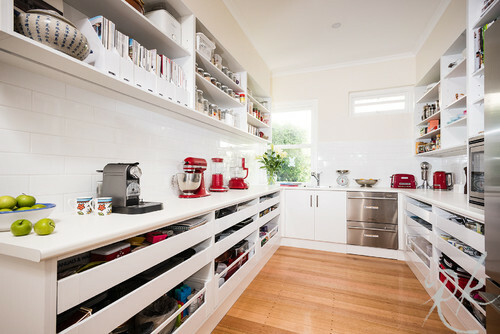 It’s a good idea to add plenty of drawers for storage under the benchtop in your butler’s pantry. These drawers will be much easier to access than shelving (although they will add to the price of your cabinetry due to the cost of the drawer hardware). Drawers can be used to store anything from pantry essentials, such as tinned and dried foods, to extra crockery pots and pans. Opt for open-fronted drawers, like the ones pictured here, so you can easily find what you are looking for without having to pull out each drawer. Depending on the floor plan of your home, chances are your butler’s pantry won’t have a window in it, so artificial lighting is really important. As well as ceiling lighting (downlights work best; a pendant dropping down from the ceiling can make the space feel small), incorporate some lighting under your overhead shelving to illuminate the bench area. Use either downlights, as pictured here, or a row of LED ribbon lighting for a more consistent casting of light. Another great addition to your butler’s pantry is having your lighting connected to a motion sensor so that the ceiling lights come on automatically when you enter the room – a useful feature when you are laden down with shopping bags. Building a butler’s pantry space into your home can add additional costs to your build or renovation, but you can save money on the materials that you use for the cabinets and benchtops. Instead of using the same stone or solid wood benchtop that you have in your kitchen, choose a matching or contrasting laminated benchtop for a fraction of the price. The key is to create a look of consistency so that there is a flow between the two areas. Also, as I mentioned before, it’s not necessary to have doors on the cabinets, and this can save you money. It also means you can easily see all the contents on your pantry shelves.For the cabinets themselves, use the same hard-wearing, inexpensive white melamine board that your cabinetmaker most probably used to manufacture the carcasses of your kitchen cabinets. A large walk-in butler’s pantry isn’t an option for a lot of us, but you can still work a great pantry space into your new kitchen without taking up too much floor space. 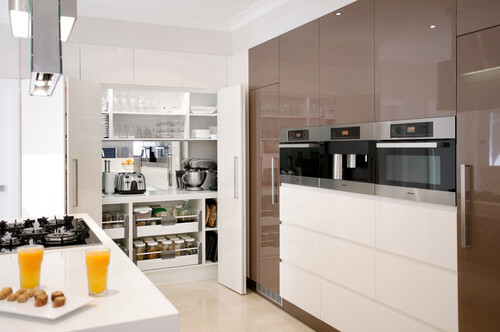 The pantry pictured here is no deeper than the other cabinets in the kitchen (about 600 to 700 millimetres) and yet includes a benchtop with space for small appliances and storage above and below in the form of open shelves and open-fronted drawers. The space is hidden behind bi-fold cabinet doors, which, when closed, give the illusion that they conceal just another kitchen cabinet. The extra bench space allows the user to keep small appliances plugged in and ready to use at a moment’s notice and also frees up bench space in the main kitchen area.